I tried flat tracking a few months ago. I blitzed the first-timer’s field until someone pointed out that I was riding a bike with a front brake and using it. So I switched to the rear brake, went for broke on the last lap and promptly ate more dirt than a stoned earthworm with poor self-control. The bike was cactus and my left knee has only just recovered. The lesson was simple; learning to go fast on dirt can be a painful exercise. 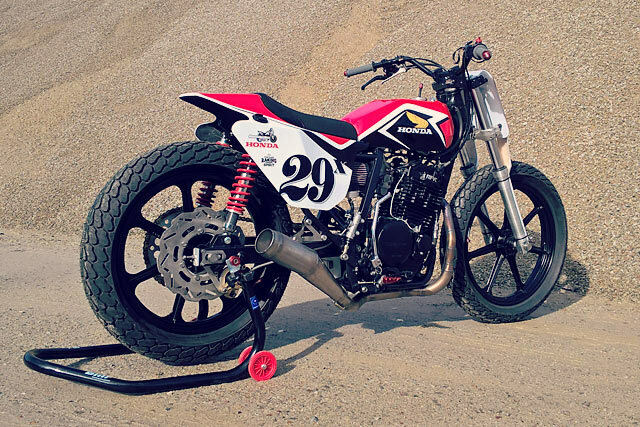 Which is probably why France’s BCKustoms has called this, their gorgeous new ‘87 Honda XL 600R flat tracker, the ‘Bone Destroyer’. 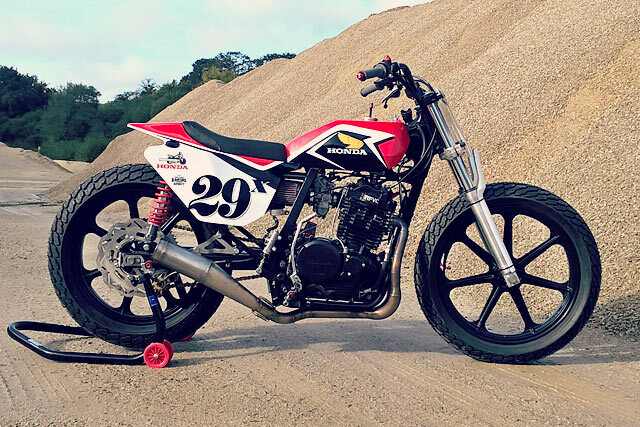 After finally getting his own wheels on track for the Dirt Quake VI event with his 1200cc HD Hooligan tracker, Yann, the BCKustoms founder was bitten by the dust bug. 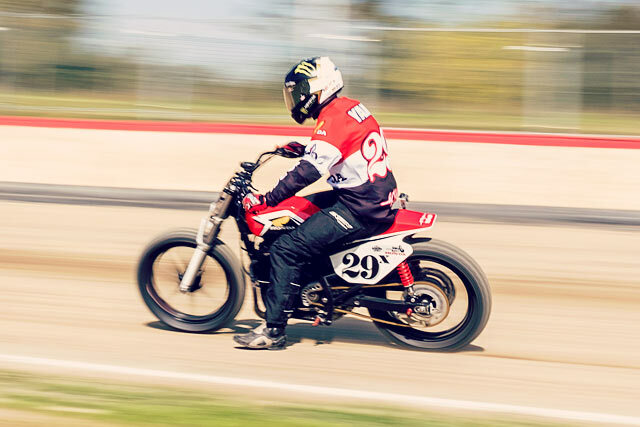 While travelling back home to the town of Quimper in France, he got a crazy idea in his head about entering some local flat track races. The only issue was that the French rulebook didn’t allow for engines over 750 cc, so sadly the Harley could only be a spectator. 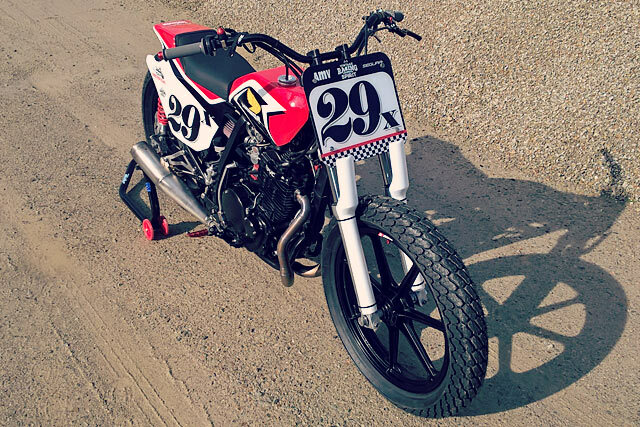 “We had a running XS500 street tracker we decided would be modified to race in the vintage class,” says Yann, “But only being eligible for one third of the races seemed like a waste. So decision was taken to build an extra racer for one of the two remaining classes”. Then he remembered that somewhere in a dark corner of the workshop was an ’87 Honda XL 600 RM fitted with twin CB500 Bitubo shocks. 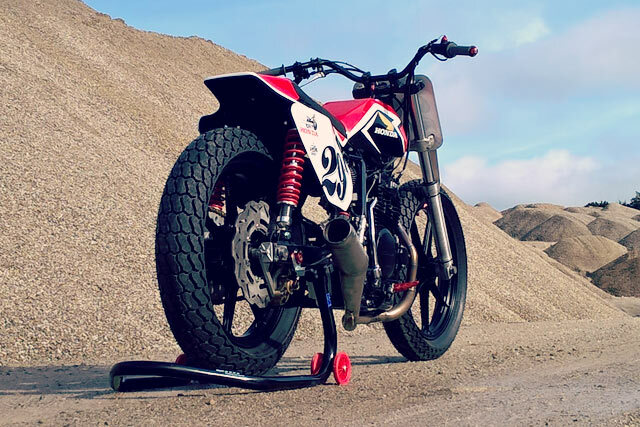 “We decided to swap the engine to an earlier XL unit with a kick starter, which then allowed us to remove nearly all the electric wiring and the battery. The bike had already been fitted with some front forks from a ’99 Yamaha R6. 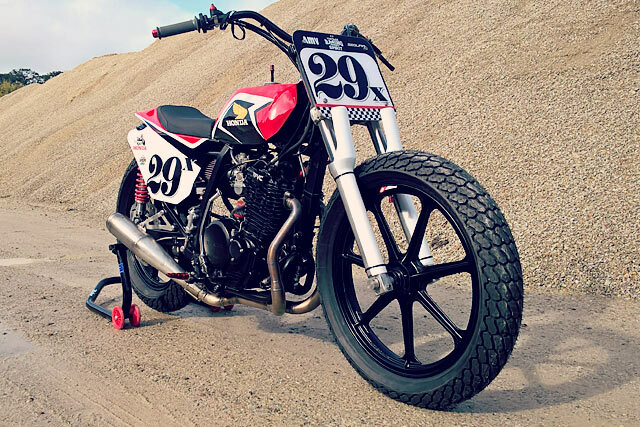 Being 41mm units like the original Honda tubes, they fit the factory triple clamps easily”. “It was promptly fitted with a dB killer to make sure that the bell-and-ear-ringing 124dB high score it managed in its first tech inspection wasn’t repeated”. Meanwhile, the original headers were swapped for homemade stainless parts leaving more space free behind the front wheel. Ending in a single right-hand side muffler, it was promptly fitted with a short dB killer to make sure that the bell-and-ear-ringing 124dB high score it managed in its first tech inspection wasn’t repeated anytime soon. 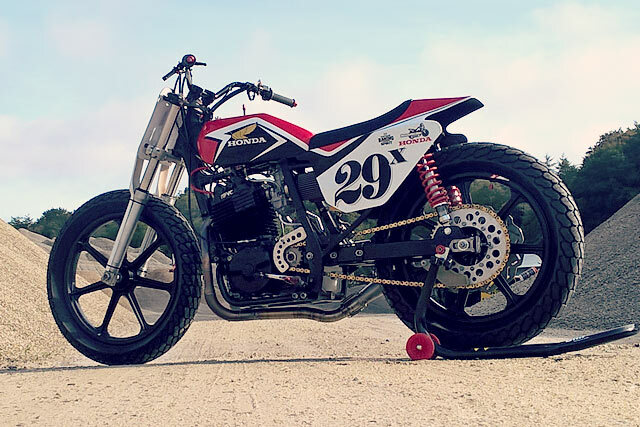 As the Hooligan HD wouldn’t be using its French racing approved mag wheels, time and money was saved by swapping them to the Honda and wrapping them up with Mitas H-18 tracker rubber. 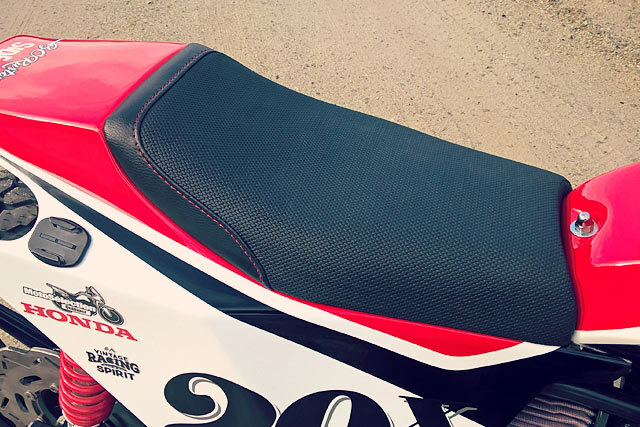 Even more time was saved on a silly tight schedule when it was realised that the Harley’s swingarm could be easily adapted to the Honda’s rear. “Once again we asked Steve at the Red Max Speed shop for some assistance in supplying the fiberglass gas tank, a ‘Champion’ model, which was then completed by a Knight-style tail section from Composite Sellerie. 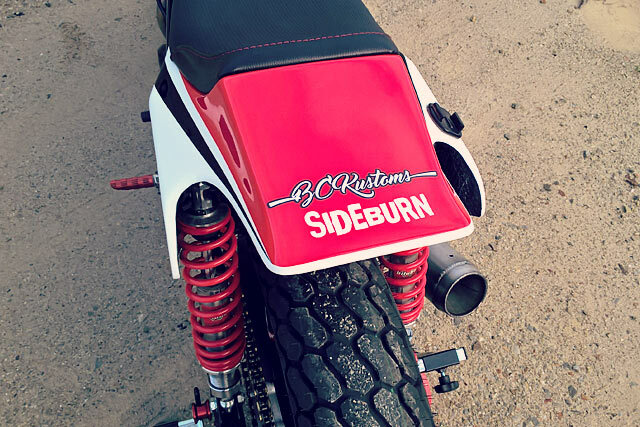 To give a modern twist to the bike’s overall look, the tail section was cut and reshaped for added flair and more weight reduction”. 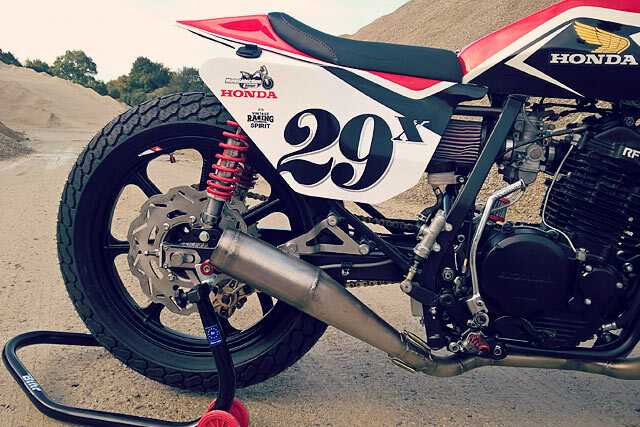 Quimper’s local Honda dealer Moto Sélection, who were already working with BCK on supplying some parts for a restoration project, decided to lend a helping (aka sponsorship) hand. So the paint scheme decision was an easy one; it would be the red-white-black official Honda colours for that year. What a cool way to say thanks for supporting a local rookie. Other finishing touches include a Suzuki GSX-R master cylinder and rear caliper with Brembo pads, a LSL flat track bar, Renthal grips and K&N filters. So in 7 short weeks, Yann has gone from a 240kg Harley tracker to a beautifully svelte, 140kg Honda one. On paper, you couldn’t ask for a better learner upgrade. Of course as the name suggests, it’s almost inevitable that sooner or later the bike will go down as Yann ups his corner entry speeds. You’d almost be sad, until you think of the trailer queen alternative to risking the biscuit. Crash on, sweet Honda. Crash on.